You already know that Salesforce is the world's leading customer relationship management solution. But did you also know that you can transform this already-powerful tool into a complete business management and accounting solution? 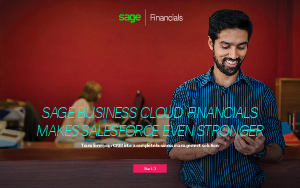 Learn more about Sage Business Cloud Financials - the accounting solution built for business leaders who want to manage their entire business in the Salesforce cloud.